Micro Combined Heat and Power Market size was valued over USD 2 billion in 2017 and is set to exceed an annual installation of 3GW by 2024. Growing measures toward adoption of renewable technologies for maintaining clean energy supply and reduction of carbon footprints will drive the global micro combined heat and power (CHP) market. Introduction of regulations and incentives including feed in tariff, subsidies and tax reduction policies will further influence the demand for micro cogeneration systems. In 2018, New Jersey Clean Program offered USD1/W incentives for small CHP system having capacity up to 500kW and USD 0.50/W for 501 kW to 1000kW CHP systems. Increasing demand for cost effective, environment friendly and reliable technology for electricity and heat generation across residential, and commercial sectors will boost the global micro CHP market. Government mandates to minimize climatic changes along with efforts to reduce electricity expenses will further complement the industry outlook. The European Commission introduced the 2030 climate and energy framework with an aim to reduce the greenhouse gas emission by at least 40% by 2030 as compared to the 1990 levels. Technological innovation in the designing of micro cogeneration systems to reduce cost and improve efficiency along with the availability of fuel variants will propel the micro combined heat and power market. In addition, positive outlook toward infrastructure sector across developing economies favored by advancing co-generation technologies will augment the product demand. Stirling engine micro combined heat and power market is anticipated to grow at over 20% by 2024. Enhanced adoption of these engines in residential establishments on account of its operability in low power range will propel the product adoption. Ability to offer less maintenance, lower gas emissions, operational flexibility and less noise are some of the features that will make its adoption preferable, thereby fueling the overall business landscape. 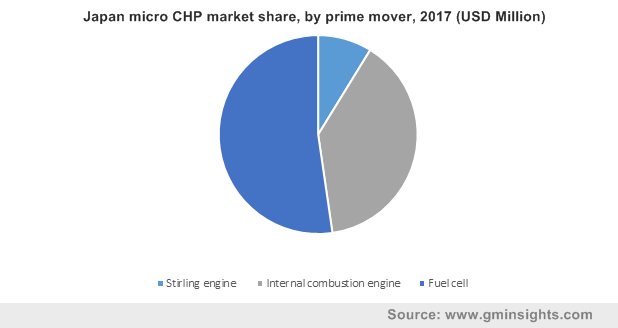 Internal combustion engine micro CHP market will witness growth on account of its compatibility with gas and liquid fuels for stationary power generation. Low fuel consumption, reliability and high energy efficiency are some of the key features that will further enhance the industry outlook. ≤ 2 kW micro combined heat and power market will witness significant growth due to increasing demand for reliable and continuous power supply from residential establishments. Rapid urbanization across developing economies on the grounds of improved living standards, demographic changes and rising disposable incomes will augment the product adoption. Ongoing expansion of co-generation units to fulfil energy & heat consumption across light commercial and tertiary buildings including hotels, business units, and multi complexes will fuel the >2 ≤ 10kW micro CHP market. Positive outlook toward the replacement of conventional boilers with an aim to reduce GHG emissions will further boost the product penetration. Natural gas micro combined heat and power market is anticipated to witness growth on account of its abundant availability and cost effectiveness. Increasing regulatory measures to reduce dependency on imported fossil fuels supported by gas fired technological enhancements across developing economies will further complement the business growth. Renewable resources in 2017, accounted for over 14% of global micro CHP market share. Rising awareness toward waste management along with limited land availability for landfills and incinerators will stimulate the product demand. Introduction of several government initiatives and incentives to promote the utilization of biomass will positively sway the industry dynamics. Residential micro combined heat and power market is predicted to expand over 30% by 2024. Growing demand of energy efficient system for hot water generation will stimulate the product adoption in these establishments. Regulatory mandates toward building emissions along with efforts to reduce electricity bills will further fuel the product deployment. 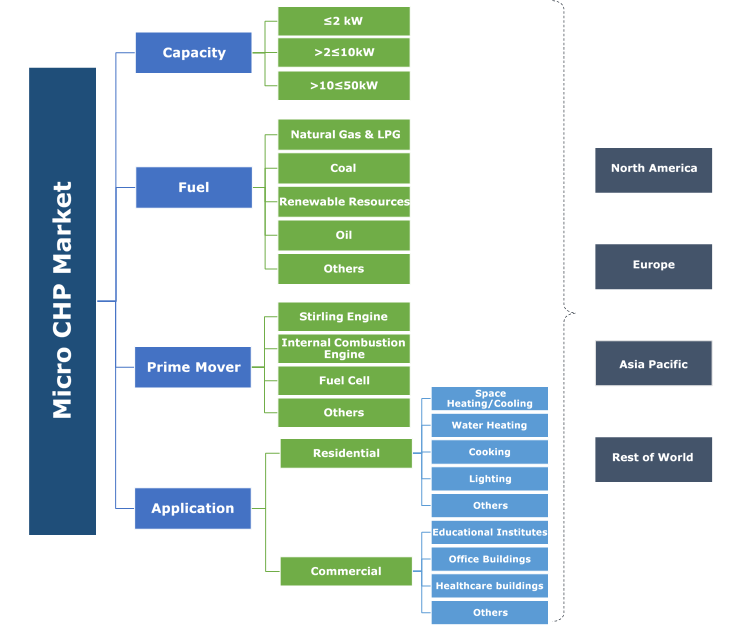 Commercial micro CHP market is anticipated to witness growth owing to introduction of codes and norms toward green buildings structures. The Renewable Heat Incentive program introduced by the Government of UK provides financial support for renewable heat generation systems across commercial buildings. Japan micro combined heat and power market size is predicted to witness growth over 32.5% by 2024. Introduction of several programs to promote the deployment of residential fuel cell micro CHP system will propel the industry landscape. The Japan government introduced the Ene-Farm program to enhance the penetration of fuel cell micro CHP systems across the residential sector. The program aims to install 1.4 million units by 2020 and over 5 million units by 2030. Introduction of initiatives to encourage the adoption of sustainable technologies along with growing demand for heating system from commercial and residential application will propel the Germany micro combined heat and power market. In 2016, KWKG 2016 Act was introduced to promote the installation of CHP plant. The Act sets target to generate 110 terra watt hours electricity by 2020.
Notable industry players include Marathon Engine Systems, Yanmar, Vaillant, BDR Thermea, Viessmann, ENER-G Rudox, AISIN SEIKI, 2G Energy AG, Samad Power, General Electric, Siemens, Veolia and Aegis energy. Technological advancement in the designing of micro combined heat and power systems to improve electrical and thermal efficiency has been witnessed in the marketplace. In 2017, Yanmar introduced 35kW gas micro cogeneration system with higher energy efficiency and easier indoor installation. Micro Combined Heat and Power is an efficient and renewable source of energy generation to produce electricity and heat simultaneously. The system utilizes several fuels, including fossil fuels and renewables consisting biomass, coal, oil, natural gas & LPG.